Your Surface comes with plenty of built-in apps. But sooner or later, those won’t be enough. 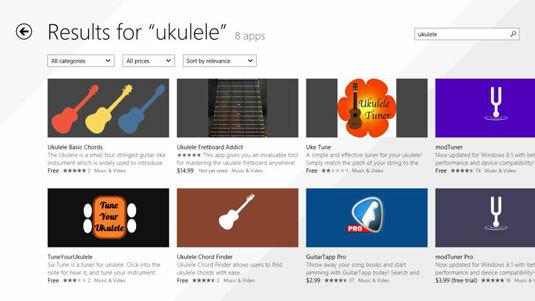 When you need to beef up your Surface with more features, there’s an app for that: It’s called the Windows Store app. Because the Surface RT and Surface 2 tablets can’t run desktop programs, they’re limited to apps downloaded from the Store app. In fact, you won’t even see apps that run on Surface Pro or Surface Pro 2. If you’re not already on the Start screen, head there with a press of the Windows key. Tap the Store app’s tile, and the Store app fills the screen. Browse for apps, tapping interesting apps to read their description, details, and reviews left by others. You can search for a specific app. But if you feel like browsing, the Store app offers several ways to window shop its app collection. As you browse, watch for the left-pointing arrow in the screen’s top-left corner. Tap that arrow to return to the Store page you just left. 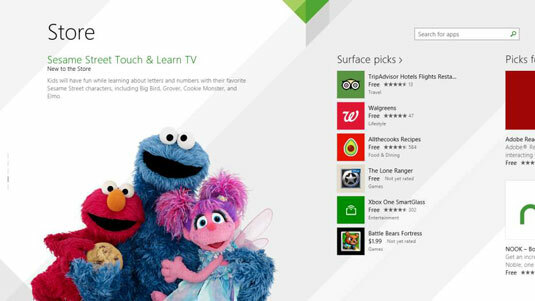 Picks for You: As your Surface learns about your interests, it places apps you may like in this category. Trending: These apps are creating a buzz, either through Internet chatter or other media attention. Give these a look to see what everybody’s talking about. New & Rising: Newly released apps that have made an impression appear here. Some are long-awaited apps that recently appeared in the store — Facebook’s app, for example. Others come from popular websites that finally took the plunge and created a Windows app to display their information. Top Paid: High-quality games, in particular, tend to appear here. Give these a close look because people are finding them worth buying. Top Free: Be sure to tap the Top Free tile to see the most popular free apps. Chances are good that you’ll want to grab the top five. You can also browse by category by sliding your finger up from the screen’s bottom or slightly down from the screen’s top. If you spot the app of your dreams, head to Step 4 to install it onto your Surface. When you can’t find what you want by browsing, try searching: Type a keyword or two that describes your app in the Search box, located in the top-right corner of every screen. 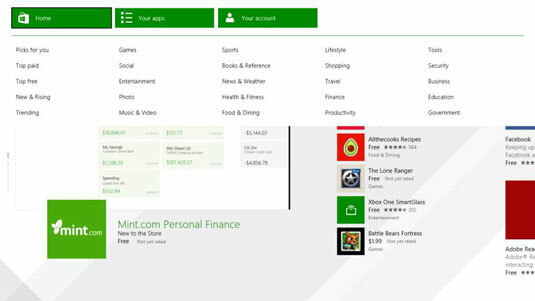 In Windows 8, searching within apps took place through the Charms bar’s Search icon. Windows 8.1 drops that approach, and now you search within apps from the Search box built directly into the app, usually in its upper-right corner. Windows searches the Store app for your key word, showing all the apps that match. Drop-down menus along the top let you sort the matching apps by their category, price, rating, and more. Tap an app’s name to read more about it. The app’s page in the Store appears and offers three ways to see more about the app. Overview: The app displays this page by default. Here, you see a picture and description of the app, its features, and ways to see more information: the app’s website, for example, as well as the app’s support page and legal terms. Details: This page may be the most important. It elaborates on the details shown in the app’s far-right pane, lists what bugs were fixed in the latest release, what processors the app supports, and the permissions it requires. Reviews: Here, owners leave comments based on their experience. Install or buy the app. Install: Found on free apps and purchased-but-uninstalled apps, tap this button to install the app onto your Surface. A minute or so after you tap the Install button, the app appears on your Start screen’s All Apps area. Try: Found on paid apps, tap this to try out the app for a week. After a week, the app expires unless you tap the Buy button, opening your wallet for the app’s full price. Buy: Paid apps cost anywhere from $1.49 to $999.99, but most cost less than $5. Tapping the Buy button lets you purchase the app immediately if you’ve already linked a credit card with your Microsoft account. No credit card link? Then the Buy button takes you to a secure website to enter that information. If you don’t see a button, the words You Own This App appear, meaning you’ve already downloaded the app. Most apps download in less than two minutes. When the app finishes downloading, a notice pops up in the screen’s upper-right corner, telling you the app was installed. There’s one oddity, though: Your downloaded app won’t appear on the Start screen. Instead, it’s in the screen below the Start screen. Slide your finger up the Start screen to pull the All Apps screen in view, and your newly downloaded app will be listed in alphabetical order with all of your other apps. Apps constantly change. 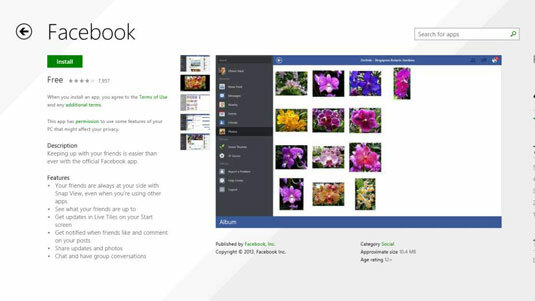 Windows 8.1 automatically keeps your apps up-to-date. Apps that run on the Surface RT and Surface 2 are known as ARM apps, named after the Advanced RISC Machines company that created the special low-power chip inside those Surface models. Surface RT and Surface 2 tablets can install only apps written for ARM processors. Surface Pro and Pro 2 tablets, by contrast, can run only apps written for x86, x64 processors.